Lujiazui, the government-designed development zone in Shanghai that accommodates almost five hundred domestic and overseas financial and insurance companies and on 9th October held a conference which many members of those institutions attended. The sprawling skyline of Shanghai downtown became the meeting ground for multitude of important people from various industries, including finance, stock exchange, banks, insurance and officials from local and state government. They came for one reason – discuss the potential of Blockchain technology. 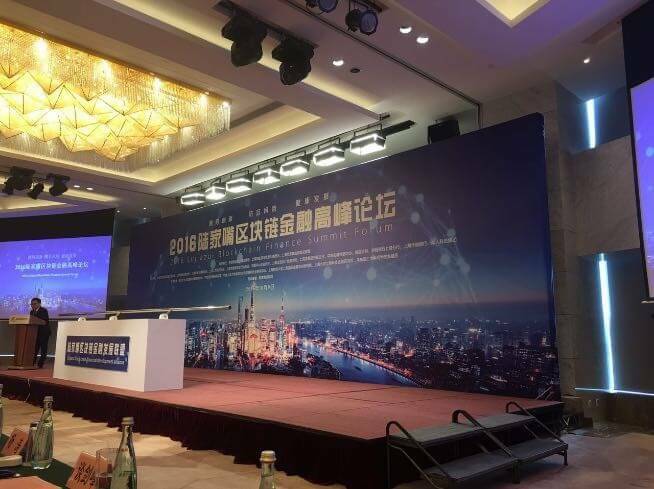 Lujiazui Blockchain Finance Summit 2016 was organized by plethora of partners, namely Internet Finance Association of China in Shanghai, Shanghai Federation of Industry and Commerce, Shanghai Listed Companies Association and Shanghai Information Security Association. Two government bodies – China Banking Regulatory Commission, together with Shanghai Municipal Commission of Economy and Informatization conducted supervision of the event, while esteemed speakers took the stage. 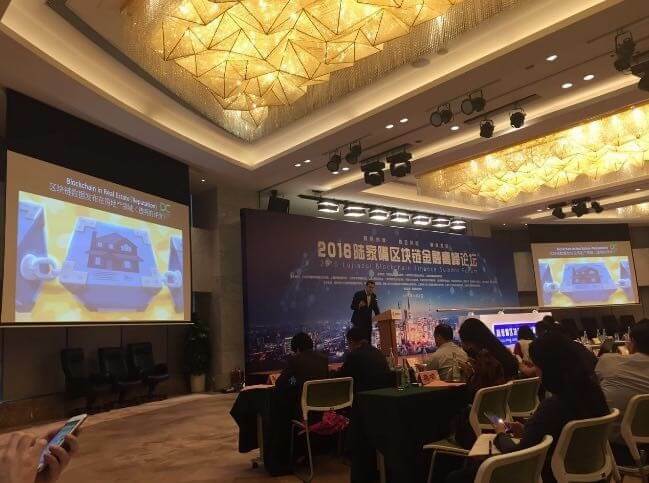 One of them, Yuehua Chen, Shanghai Municipal Economy and Informatization Commission Inspector, opened the conference with overarching theme of Blockchain as an integrated and cooperating system, applied by finance industry to combat various issues. He pointed out that the current mechanism of third-party credit verification may hinder companies from obtaining loans or investments, unless they pay. Build-in Blockchain protocol would enhance data’s credibility, therefore investment institution or bank could immediately access all necessary info to easily evaluate client’s trustworthiness. Conference motto – Embrace innovation, prevent risks, develop in a healthy way – was echoed through by every speaker. One that encapsulated it thoroughly came from Slovakia, representing start-up DECENT. Matej Michalko, co-founder of DECENT introduced company’s vision to local audience. He clarified the benefits of blockchain, e.g. immutability, security, decentralization, what he followed with putting light on the topics of cryptography, intensive data distribution and a way transactions are recorded in Blockchain. After that, he elaborated on soon-to-be available applications, such as DECENT Web, DECENT Stream, DECENT Music, DECENT Books. Also, Horizon 2020, the project aimed at clean and efficient energy distribution and low carbon initiatives sparked an overwhelming curiosity among, predominantly Chinese, crowd. The mood balanced between excited and genuinely ecstatic. 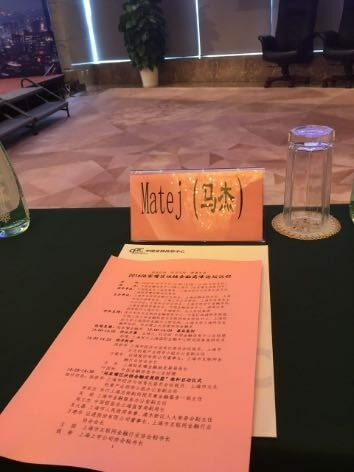 Lujiazui Blockchain Summit became licensed under Lujiazui Blockchain Alliance, founding father of which are Shanghai Financial Services Office, People’s Bank of China HQ in Shanghai, Shanghai Municipal Commission of Economy and Informatization, China Banking Regulatory Commission and Lujiazui Financial City Development Board. This fact is crucial for DECENT. Partnering, or becoming a member of Alliance could open door to, otherwise though, chinese market. Alliance could persuade potential investors to get involved with DECENT. Not only that, DECENT could procure the most updated regulatory policies, thanks to the immediate contact with the officials. In the end, goal to adopt our Blockchain tech by other investors and customers would be easier to achieve. Lujiazui conference is one of many our team will attend this month. In following weeks, Matej Michalko presents DECENT vision in Beijing, Shenzhen and Shanghai again. We will join him and report about the atmosphere, ideas and news from this events. Just in a few days, undeniably the most stirring event of this month is going to take place in Lujiazui again. Without disclosing too much, our team is proud of this historic moment. If you need to feed your curiosity, subscribe to our newsletter and patiently wait for reveal.